Two new builds constructed and completed in 2018 by one of the busiest and best local construction companies in Mallorca. Years of experience and knowledge of local products plus materials have completed these properties and the results are lovely. A local, talented architect together with the construction company have produced light, spacious living areas combined with traditional stone work resulting in two properties with all modern conveniences but retaining traditional traits. Located on a quiet country lane with an eight minute walk into the village centre these properties could not be better situated with the best of country life combining easily with the village. Property number two: on the ground floor a drive - in garage with automatic entry door, the boiler and heating systems are also housed in the garage, it is possible to enter and exit the house through the garage. From the front entrance the property opens into a large open plan living room with wood burner, central heating throughout, a designer staircase made from iron and produced by local tradesmen, spacious utility room / bathroom. From the living area the space leads to the open formal dining area and modern fully fitted kitchen with bespoke units, oven, hob, dishwasher, extractor fan and fridge freezer all included in the price. There is a private terrace leading off the dining and kitchen areas with double doors opening to the exterior and private terrace. A staircase leads from this terrace to the back upper terraces and garden, brilliant views of the countryside and village from these upper levels; it is possible to install a swimming pool if desired. Back in the house, the first floor has a generous master suite with fitted wardrobes, en suite both with bath and walk in shower plus double basins. A second double bedroom with fitted wardrobes and en suite plus a third double bedroom with fitted wardrobes. All bedrooms have windows with views and central heating. There is another full bathroom on the first floor for guests and third bedroom. 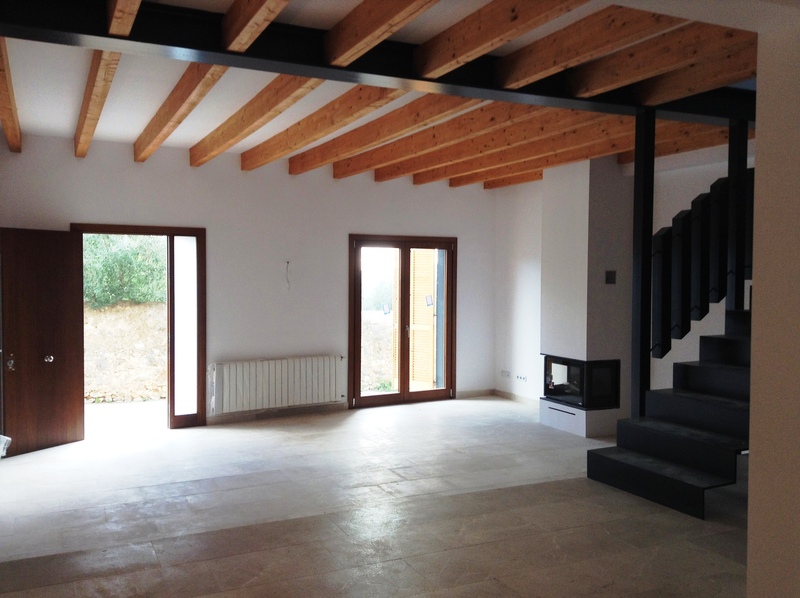 Clever twists are the sky light windows in this property which draw all the wonderful Mallorcan light into the interior enhancing the already light and bright spaces. Modern but with character, private but eight minute walk into the village both these lovely houses would make excellent full time homes, investment purchases for the long term rental market or as holiday homes in the wonderful World Heritage Site of the Sierra de Tramontana. Alaro is a twenty minute drive to the beautiful city of Palma and twenty five minutes to the International Palma Airport. A local population of approx. 5400 residents, supermarkets, schools, doctor, dentist, parks, sport stadium, banks, restaurants, cafes, bars, train station and wonderful local fiestas. Contact us now for a viewing!